Sell products by weight, by volume, or other standard units of measurement. Shopventory refers to selling products this way as 'Per Unit' pricing. Shopventory only manages 'Fixed' pricing from our interface. Fixed pricing is the "usual" setup where a product just has a standard price and only whole quantities are sold. 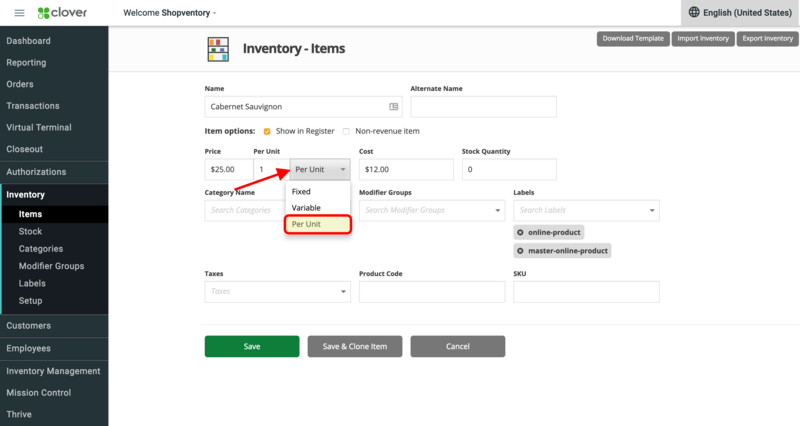 Shopventory only has options to manage Fixed pricing from our system, but 'Per Unit' pricing designations can be imported. Go to your merchant account integration provider's system (i.e. Clover) and set the pricing type on those products. Go to the Locations and Integrations tab in the 'Settings' section of Shopventory and import the inventory catalog only. This will prevent Shopventory from changing it back to Fixed pricing.